Photo courtesy of Chris Crutcher. The NYM-ACTUAL-BOOK CLUB (ages 14+) will discuss Staying Fat for Sarah Byrnes by Chris Crutcher. Globe and Mail columnist Sandra Martin honours the lives of Canada's famous, infamous, and unsung heroes in Working the Dead Beat, a unique collection of obituaries of the first decade of the twenty-first century. Here are Canadian icons such as Prime Minister Pierre Trudeau, economist John Kenneth Galbraith, social activist June Callwood, and urban theorist Jane Jacobs. Here are builders such as feminist and editor Doris Anderson, and businessman and famed art collector Ken Thomson. Here are our rogues, rascals, and romantics; our service men and women; and here are those private citizens whose lives have had an undeniable public impact. Finally, Martin interweaves these elegant and eloquent biographies with the autobiography of the obit writer, offering an exclusive and intimate view of life on the dead beat. In her eagerly awaited third collection, Reconciliation, Dorothy Speak brings her familiar wit, compassion and irony to bear on stories about the fragility and elusiveness of love. A house painter whose wife dies of cancer learns a painful truth about his marriage from his estranged son; a woman involved in a fatal car accident discovers that the husband she took for granted has become a stranger; a small-time journalist in a coastal city is betrayed by her best friend. These stories about adult relationships in urban settings explore the themes of loss, betrayal and self-discovery for which Speak has been praised. Carolyn Abraham, bestselling author and senior medical-science writer for the Globe and Mail, explores the stunning power and ethical pitfalls of using genetic tests to answer questions of genealogy--by cracking the genome of her own family. Armed with DNA kits, Abraham criss-crosses the globe, taking cells from relatives and strangers, a genetic journey that turns up far more than she bargained for--ugly truths and moral quandaries. With lively writing and a compelling personal narrative, her new book The Juggler's Children tackles profound questions around the genetics of identity, race and humanity, and tells a big story about our small world, with vivid proof that genes bind us all to the branches of one family tree. Chris Crutcher discusses his works and writing process. Abe nominee and critically-acclaimed author of King of the Mild Frontier, Staying Fat for Sarah Byrnes and Ironman, Chris Crutcher will share his life experiences and writing style, answer questions and award the prizes for the Cool Compositions contest. Get tickets in Youth Services. Chris Crutcher , Whale Talk. Chris Crutcher's book Girl Meets Boy was available from LibraryThing Early Reviewers. 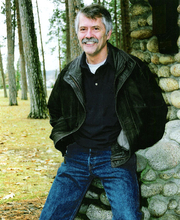 Chris Crutcher is currently considered a "single author." If one or more works are by a distinct, homonymous authors, go ahead and split the author. Chris Crutcher is composed of 5 names. You can examine and separate out names.